A very comfortable 22” wide ‘Memory Foam’ seat. Large rear wheels with air-filled tires make for a more comfortable ride. While it is foldable and does come apart the parts are very heavy and cumbersome. As it may be too long for most scooter carriers you may need a more expensive ramp. If you’re looking to be the coolest thing on wheels then this is the mobility scooter for you! Wow…and wow again! If you’re looking to be the coolest thing on wheels, this is the mobility scooter for you! I was really looking forward to having a go on the Tzora Hummer XL 4-Wheel Electric Mobility Scooter and asked my service technician, and friend, if when he had one, he would give it to me for a few days for a test drive…he didn’t disappoint…and neither did the scooter! 1. The Tzora Hummer XL is rear-wheel drive, has a weight capacity of 300 lbs., (although I would consider this number to be a little cautious), comes with two SLA (Sealed Lead Acid) 12V 26 Ah batteries, each weighing 21 lbs. for a total scooter weight of 159 lbs., (with a charge time 8-10 hours), a travel range of 15+ miles and a top speed of almost 7 mph. 2. Right and left turn signals, rear tail lights, a halogen front headlight, front running lights and even reverse tail lights are certainly worth consideration if you spend any time traveling after dark. 4. The large rear wheels (13.4” x 2.6”) use air-filled tires which certainly makes the ride more comfortable. 5. It has keyed ignition and comes with a wire rear basket, anti-tip wheels and an accessory holder (for an oxygen tank or crutch etc.) as standard. 6. The batteries are in their own case, are located over the back wheels and are easily removed by simply lifting up with the grab handles. When you are ready to use the Tzora Hummer XL 4-Wheel Electric Mobility Scooter again you simply set the battery packs back in place again and the terminals automatically make their connection. 7. With a generous ground clearance of 3” the scooter is designed more for the outdoors and I was very pleasantly surprised with how it tackled sharp inlines and bumpy terrain. But with its weight (159 lbs. ), length (54”) and a very large turning radius of 39” it is far from ideal around-the-house. The warranty period for the Tzora Hummer XL is twelve months and covers faulty materials and workmanship (consumables not covered: tyres, upholstery, lamp bulbs, plastic coverings and batteries). This is the big drawback with this scooter – while it is foldable and does come apart, the parts are very heavy and cumbersome and even difficult to fit into the cargo area of an SUV. A two-person job I’d say! 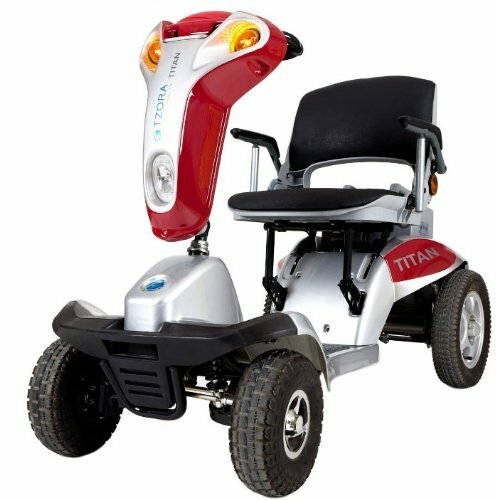 If economically feasible, I’d recommend, if possible, the Tzora Hummer XL for outside and also buying a smaller wheelchair or scooter such as the Drive Medical Scout 4-Wheel Scooter for use around the house or apartment. So here’s the dilemma all of us who use electric wheelchairs or mobility scooters face – do we go for light and foldable or heavy-duty, comfortable and secure? Surely there must be a way to combine all these elements. The Tzora Hummer XL 4-Wheel Electric Mobility Scooter is a step in the right direction but come on you engineers and designers!